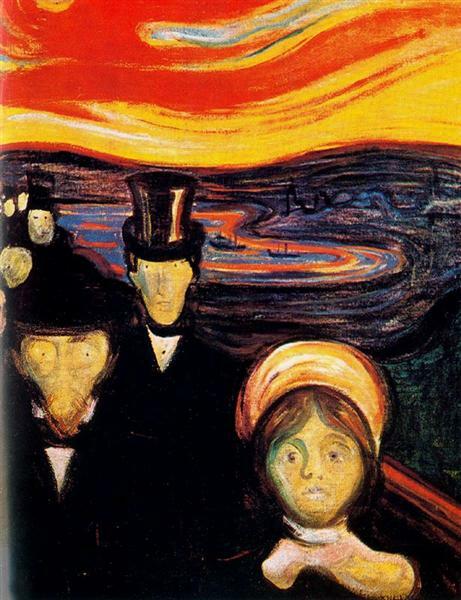 Munch had a troubled familial past. In addition to his overbearing pietist father, his mother died of tuberculosis when he was a small child, and his sister died nine years later of the same disease. This painting is an image of Munch’s older and favorite sister Sophie lying in bed, dying of tuberculosis when she was 15 years old. 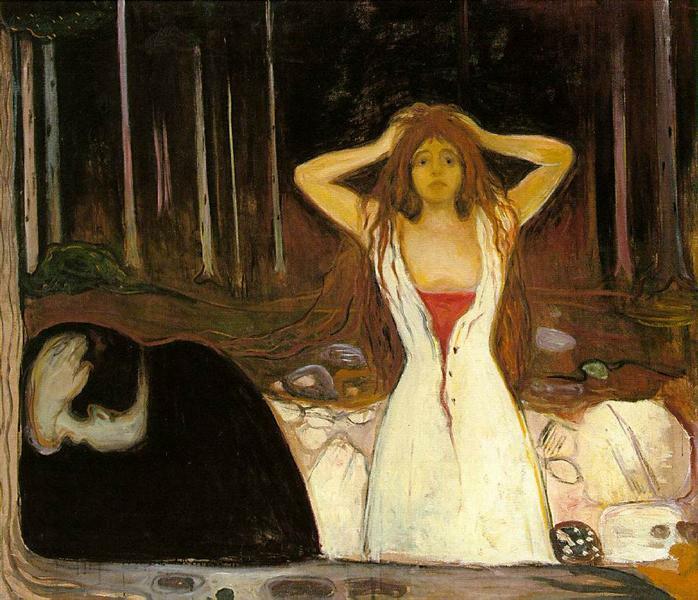 Munch created many reproductions of this painting, including one that was held in Dresden, Germany. In the 1930’s and 40’s Nazi’s deemed Munch’s art as “degenerate art” and removed all of them from Germany to be sold at auction. This piece was bought and later donated to the Tate Gallery in London, where it remains today. 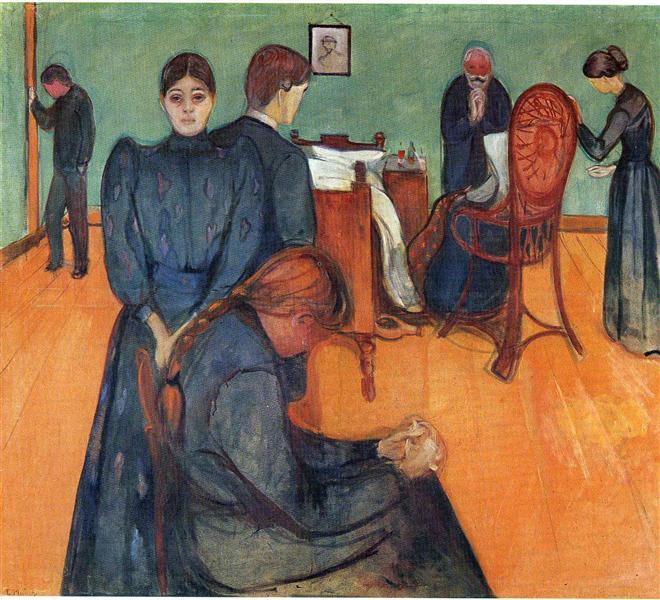 The Sick Child (Norwegian: Det syke barn) is the title given to six paintings and a number of lithographs, drypoints and etchings completed by the Norwegian artist Edvard Munch (1863–1944), between 1885 and 1926. All record a moment before the death of his older sister Johanne Sophie (1862–1877) from tuberculosis at 14. 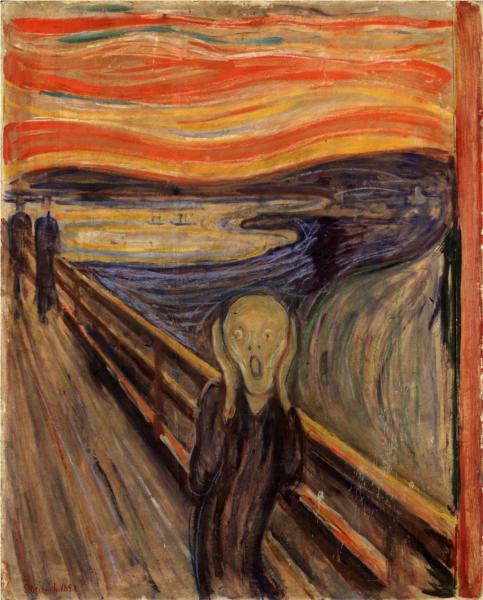 Munch returned to this deeply traumatic event again and again in his art, over six completed oil paintings and many studies in various media, over a period of more than 40 years. In the works, Sophie is typically shown on her deathbed accompanied by a dark-haired, grieving woman assumed to be her aunt Karen; the studies often show her in a cropped head shot. In all the painted versions Sophie is sitting in a chair, obviously suffering from pain, propped by a large white pillow, looking towards an ominous curtain likely intended as a symbol of death. 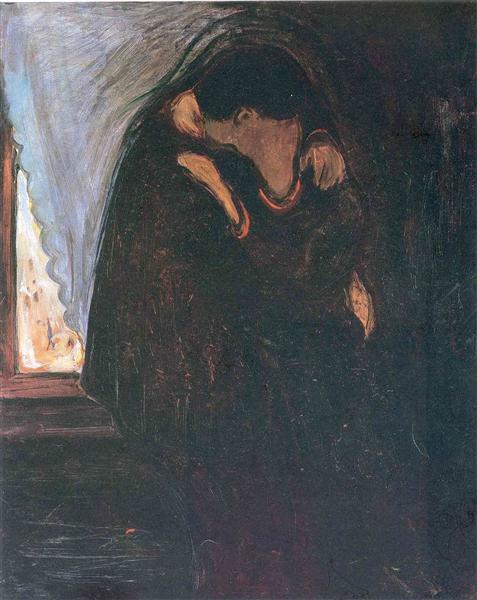 She is shown with a haunted expression, clutching hands with a grief-stricken older woman who seems to want to comfort her but whose head is bowed as if she cannot bear to look the younger girl in the eye. Throughout his career, Munch often returned to and created several variants of his paintings. 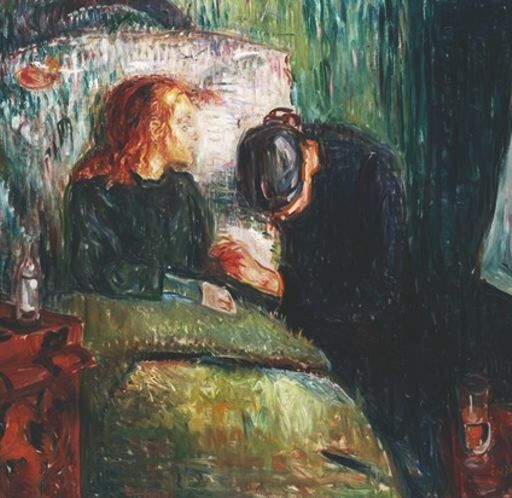 The Sick Child became for Munch—who nearly died from tuberculosis himself as a child—a means to record both his feelings of despair and guilt that he had been the one to survive and to confront his feelings of loss for his late sister. He became obsessive with the image, and during the decades that followed he created numerous versions in a variety of formats. The six painted works were executed over a period of more than 40 years, using a number of different models. The series has been described as "a vivid study of the ravages of a degenerative disease". All of the paintings and many of the ancillary works are considered significant to Munch's oeuvre. An 1896 lithograph in black, yellow and red was sold in 2001 at Sotheby's for $250,000. Each painting shows Sophie in profile, lying on her deathbed, and obviously having difficulty breathing, a symptom of advanced, severe tuberculosis. She is propped from her waist up by a large thick white pillow which partially hides a large circular mirror hung on the wall behind her. She is covered by a heavy dark blanket. She has red hair and is shown as frail and with a sickly pallor and vacant stare. She looks towards a dark and portentous full-length curtain to her left, which many art historians interpret as a symbol of death. A dark-haired and older woman in a black dress sits by the child's bedside, holding her hand. The bond between the two is established through the joining of their hands, which are positioned at the exact center of each work. Their shared grip is typically rendered with such pathos and intensity that art historians believe that not only did the two figures share a deep emotional bond, but that they were most likely blood relations. In probability the woman is Sophie's aunt Karen. Some critics have observed that the older woman is more distressed than the child; in the words of critic Patricia Donahue, "It is almost as though the child, knowing that nothing more can be done, is comforting a person who has reached the end of her endurance". The woman's head is bowed in anguish to the extent that she seems unable to look directly at Sophie. Because of this, her face is obscured and the viewer can only see the top of her head. A bottle is placed on a dressing table or locker to the left. A glass can be seen to the right on a vaguely described table.